As we’ve seen countless times on our leisurely stroll through rock ‘n’ roll’s earliest days, record companies were often very calculating when it came to assigning names to instrumental records. Because these songs had no lyrics and since a lot of artists were newly reconstituted session musicians who were used to cutting whatever the producers requested of them, their own creative id going largely untapped, the job for picking a name for these things fell to the record label themselves. Occasionally they came up with intriguing titles, things that either gave some indication as to the artist’s style or which simply might sound rather alluring to somebody scanning a jukebox or flipping through a record bin at a store. But at other times, most times in fact, the record company tried using these titles to curry favor with disc jockeys or simply scanned the menu at a Southern soul food restaurant and picked a dish to try and entice rock fans who presumably might be hungry for a meal AND a record at the same time. In the end I suppose it doesn’t really matter, other than it giving us something to talk about since we’re deprived of two thirds of the content to analyze that vocals records have to offer. These titles admittedly don’t mean much, they rarely factor too heavily in the success or failure of the record, but by this point in the Twenty First Century with those who made these songs long since departed taking with them whatever secrets they held, the titles are often the one piece of evidence we have to scrutinize in an effort to try and get a feel for what they were thinking. Or, in this case, it only gives us the chance to get even more confused. Freddie Mitchell was originally from Florida but moved to New York in his early teens which is where he first plied his trade as a saxophonist in a number of bands throughout the 1940’s. No doubt these bands, including those led by such big names as Benny Carter, Fletcher Henderson and Louis Armstrong, traveled the country and so it’s possible that Mitchell spent a little time zig-zagging the Midwest, but it’s doubtful he spent much time there or saw the sights other than the few blocks between his hotel and whatever club they were playing. Likewise Derby Records was situated in New York and its founder, Larry Newton, was from Philadelphia, so any connection to a state some seven hundred miles away isn’t apparent from the limited biographical information we have on him. Thus we look elsewhere, like say a train, but according the the Indiana Transportation Museum (yes, there is such a thing), the trains took on the name of the Nickel Plate line they ran on, but the last passenger train ended in the thirties, though freight trains continued under that moniker for another few decades. Today there’s an old Nickel Plate Express train used for tourism but that’s the name it uses, not any reference to the state itself. There IS an Indiana Travel Express bus that goes to New York, but there’s no mention of when it began or if certain sax players used it back in the 1940’s and if they did why on earth they might want to title a song after it. Buses are hardly a luxurious way to travel and back then I’d imagine they’d be even less comfortable. There’s not even any athletes with that nickname that I know of… flame-throwing Hall Of Fame pitcher Amos Rusie was known as The Hoosier Thunderbolt, which I suppose is close in theory. Not that he was actually FROM Indiana, mind you, but he played his rookie season for a team based in Indiana where he picked up the nickname, though I hardly suspect that anyone still around in 1949 had been a season ticket holder back in 1889 when Rusie hurled for the Hoosiers. By now, having spent more time on Wikipedia in this fruitless quest than is advisable for those who aren’t total shut-ins I’ve lost interest and – assuming you had any interest yourself to begin with – I’m sure I’ve shed a few dozen bored readers in the process of this excursion. But then again where else can you read about trains, buses and 19th century pitchers if not a history of rock ‘n’ roll website? All of which brings us back to the point of this diversion which is the title of Freddie Mitchell’s latest record, Indiana Express. 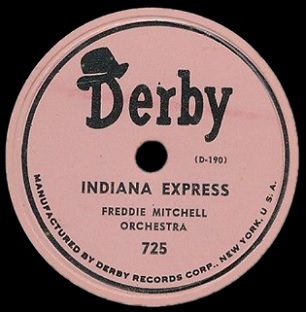 Mitchell was still riding the popularity of last summer’s Doby Boogie, named for Cleveland Indians outfielder Larry Doby, the man to break the color barrier in the American League two years earlier, and that record was still pulling in strong sales around Ohio thanks to this connection. Maybe Derby Records figured that by moving one state westward they’d lock up the coveted midwest record buying cabal and start an empire with their honking sax player as its leader. Now that we’ve had our fun jerking your chain we can get to the record itself and although it didn’t make the Billboard national charts it DID make spend eleven weeks in the Top Ten on the Cash Box listings… for New York. 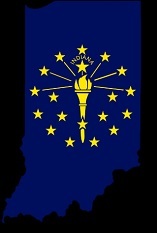 No word on whether folks in Indy liked it. Oh well, what matters is the music, not the trivial minutia and once again with Mitchell we’re left trying to ascertain just how much progress he’s making adapting his jazz background to the rowdy back alleys of rock ‘n’ roll. He started off very uncertain of his direction back in June when he not only became Derby’s first signee, but also was tabbed to be their A&R man and oversee the recordings of the rest of their rather paltry roster. But after some awkwardly tentative first steps he made a discernible jump up in quality by his third outing but since then he’s sort of stalled in his progression. The last few sides have all been cut from the same cloth and without much in the way of noticeable efforts to improve upon his rather straightforward approach. On both sides of his last single, the holiday offerings Jingle Bell Boogie and Auld Lang Syne Boogie, Mitchell was plagued by pianist Rip Harrigan’s excessive use of the treble keys, something which reached critical levels on the flip side of this release, Pony Express, thereby negating what was a pretty good effort from Mitchell himself on tenor sax. Sure enough we haven’t yet divested ourselves of this malady on Indiana Express as the piano kicks this off at the upper register but thankfully this time around it actually shows a semblance of melodic logic, as it’s played with less force, less frantic edge of your seat intensity and is being used for more practical purposes. You’d still like to see them segue into the middle register after the intro, maybe even get within hailing distance of middle C, which would be much more effective structurally as it’d lead into a similar tone when Mitchell starts to blow, but at least for once you aren’t cursing your record player when you keep hearing him hammering away on the F in the seventh octave until your head is ready to explode. There’s a reason why on 61 note pianos they eliminate these extremely high keys and it doesn’t take long to figure out that they aren’t really necessary for most pieces… unless of course you are employed as the Derby session pianist who has apparently purchased a long term lease on that end of the piano. But while he still is proudly planting his musical flag in that general neighborhood, at least he’s mowed the lawn and taken in the trash so when we drive by we aren’t rolling up the windows and looking away in disgust. The drums help to distract us too and as a result the set up here is a little more palatable for Freddie Mitchell to make his entrance. As usual it’s a lusty sound that Mitchell possesses and he’s got all of the basic requirements for role down pat. He sets an aggressive pace and gradually ramps things up without losing control, which is always a risk for those who mistake speed for excitement. He has a strong tone, never wavering and never trying to toss in fancier runs to show us that his chops extend beyond the roadhouse doors. He’s able to balance an adherence to melody without losing the ability to dig down for more emphatic punctuation when needed. In other words, Mitchell handles his business just fine. There’s nothing here that is going to be so memorable as to get stuck in your head until you need to keep hearing it everyday to get your fix, but if you DO hear it every day you certainly won’t complain… until the midway point when a certain piano player returns for an unwelcome cameo appearance. Going back to the start of Mitchell’s stint with Derby Records we see that no matter who manned the keyboard the basic approach remained the same. Hit those high notes, then hit them some more. Since Mitchell was also the A&R director for the company, fully in charge of their sessions, and since he wrote and arranged the songs, then he’s ultimately got to take on some responsibility for these repeated shortcomings, even if he isn’t the one who has overeager fingers and a tin ear. The first half of Indiana Express is better than average. Not great, but certainly good enough and had they closed it out strong then maybe it would’ve elevated it to the next level. But instead it drops back down a level, if not two, because of the piano which fast becoming the millstone around Freddie Mitchell’s neck. The problem here is while those higher notes worked well enough with a more appropriate melody that started this, once it deviates from that when it comes back in after Mitchell’s solo it brings us back to the ill-conceived strategy of using the most drastic sound they can find to apparently emulate restless delight of some sort… though if you have an alternative theory on this feel free to leave a comment. The other horns are now blowing a repetitive counterpoint that does nobody any favors while the piano wanders around like a drunk in the night, never going to his left even once. Since Indiana is known for its hoops we can compare this trait to a basketball player who excessively favors one hand which makes it far easier to shut them down when playing defense against them because their moves are so predictable. If instead these high notes were simply broken out at sporadic intervals while playing a more sensible solo centered around the warmer tones in the center of the keyboard then maybe it’d catch you off guard when he goes higher and that startling contrast might work well. But since the shrill notes never let up we’re looking to make a hasty exit as soon as it begins. When Mitchell returns for the fade he sounds as good as ever and you wish that while he wasn’t blowing into its mouthpiece he would’ve used the business end of the saxophone to club the piano player over the head, bludgeoning him into unconsciousness and then calmly call for “Take Two!” while they haul the carcass out the door and let the results of the piano-less track that followed speak for itself. I suppose it’s too much to ask a musician to commit aggravated battery for the sake of a record, though surely any jury with ears would absolve him of the crime once the first take with the piano was submitted into evidence. Unfortunately for Freddie Mitchell the statute of limitations for reviewing an age-old record has no expiration date and thus Indiana Express will have to face the consequences of its crime against our hearing. That half of it, or even a little more than half if you were to add up each second sans piano, is really quite good makes downgrading the record as a whole more problematic… until you realize this is far from their first offense. Once we can forgive. Twice we might be able to convince ourselves to overlook and give them the benefit of the doubt, but approaching a half dozen times is far too much to be able to grant them immunity. So we’ll say once again that when Freddie Mitchell is playing his instrument without the interference of one particularly dippy sideman, he’s shaping up to be a worthy rock ‘n’ roller. But when these dippy sidemen approach the piano with the goal of boosting the stock of aspirin companies they’ve apparently invested heavily in by playing headache inducing parts, well, that’s when you need to to take drastic action like pulling a fire alarm in the studio or faking a heart attack. Better yet, just take the hammers off the last dozen keys on the right side of the keyboard… or come to think of it get rid of the piano altogether and hire a guitarist instead. Leave a reply on "Freddie Mitchell: “Indiana Express”"